Is something I mostly object to, especially when they are more than one or two hundred years old. 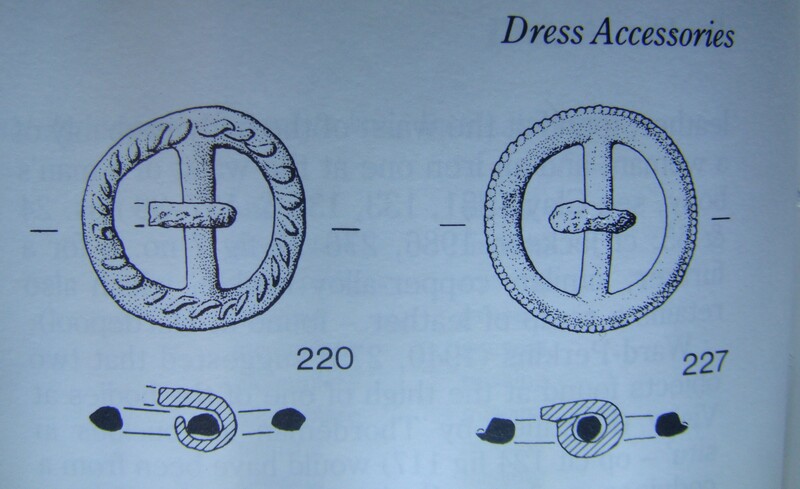 I’ve actually seen a couple of people offering medieval buckles for sale attached to leather belts. There are two reasons why I think this is wrong. One is that you are wearing out a historic artefact by using it; we have a limited number of them, and I’m sure that future wars, accidents and fires will decrease the stock well enough without you helping. Secondly, in some cases such as belt buckles, you simply can’t get the same look as with the original, because surprise surprise, there’s 600 years patina of corrosion and you can’t polish it back up to how shiny and smooth it would have been when new. They wouldn’t have worn a dark surfaced slightly pockmarked buckle, so neither should you. Your clothing and accessories should be aimed at producing a medieval (or other, insert to suit) impression, not one of someone dressing up medievally or what they think people looked like in films. If thinking about gold or silver, see point one. Buckles and the like count as both one and two. There might be some objects which manage to be in good condition and not wear out, but they are few and far between. Other periods like WW2 I’m a bit less bothered about, but are you sure there are copies of your uniform/ book/ folding stool in storage somewhere for the future, before you wear them out with use?